Pangandaran is one of the areas in West Java that is famous for its beaches. The first time I went to this place is when I was 9 years old and finally I went to this place again on the sixth semester holiday, precisely in July 2018. I went to Pangandaran with 9 of my friends to did Kuliah Kerja Nyata (KKN), where we were appointed in a village in Ciliang Regency Parigi . The trip from Jatinangor to Pangandaran took approximately 6 hours by car. We stayed in one of the residents’ houses located on the side of the street not far from the Pantai Batu Hiu. There, we conducted an sosialization on how to increase the production of Ciliang villagers through social media communication. We were there for one week. In addition to served the community, we also took advantage of our free time to visit several tourist attractions in Pangandaran. 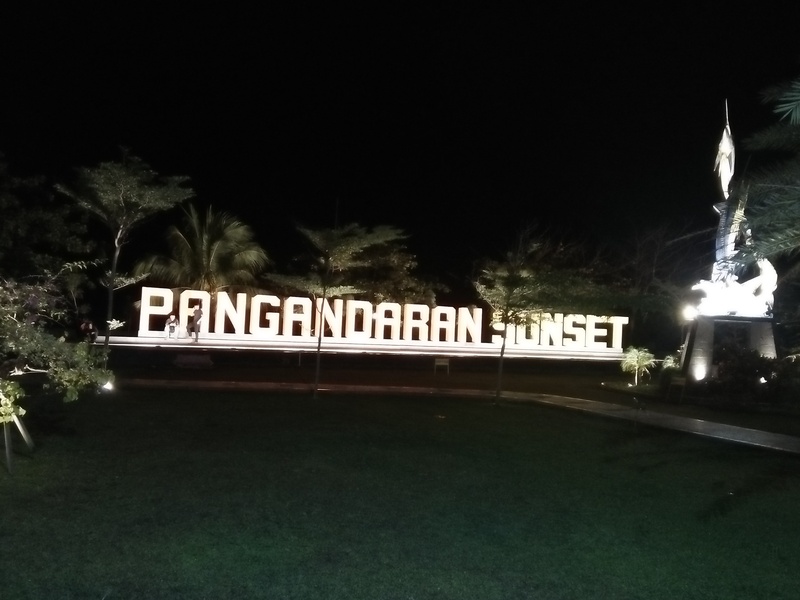 Pangandaran has many beautiful tourist attracrion, and we visited a number of places such as Pantai Pangandaran, Pantai Batu Karas, Green Canyon and Citumang. In Pangandaran there are many tourist attractions that can be visited, but the transportation in Pangandaran is very difficult. There are only public transportations which only operates until around 4 to 5 in the afternoon. between 4 and 5 in the afternoon. Although the transportation in Pangandaran is limited, it did not dampen our intention to visit tourist attractions in Pangandaran. The first destination we visited was the most famous place in this area, the Pantai Pangandaran..
On Pantai Pangandaran we took a boat ride and swam on the Pantai Pasir Putih which was very clear we saw an upside down foreign ship which were confiscated by the Ministry of Marine Affairs and Fisheries Republic of Indonesia Mrs. Susi Pudjiastuti because they fishes in the Indonesian waters illegally. Pantai Pangandaran is also famous for its beautiful sky after sunset. In addition to Pangandaran Beach, we also visited another beach, Pantai Batu Karas, which is famous for its large but safe waves, this beach is a favorite destination for tourists to surf and swim, near this beach there are also delicious and inexpensive seafood eating places. Other than being famous for its beautiful beaches, Pangandaran also has other destinations that are no less interesting, one of which is the Green Canyon or Cukang Taneuh. Green canyon is one of the tourist attractions visited by many domestic and international tourists. In this place we can do rafting and see beautiful scenery. Before arrived to the rafting site, we had to travel first by boat. Along the way we could see beautiful scenery, this place is surrounded by shady trees and passes through the cave which adds to the beauty to this place. Upon arrival at the rafting site, we were immediately presented with a very clear view of the water, the water was clear green and there were towering stones that could be used to jump to add excitement and trigger adrenaline. We were very happy to be in this place because we could play water and saw beautiful scenery. In addition, this place also has a waterfall that is above the rocks which, according to the beliefs of the local community, the water from the waterfall has many benefits, including making it easier to get a partner, can cure illnesses and can ease your fortune. When my friend named Irfan wanted to take the healtful water, suddenly there was a sound of a man screaming, it turned out that my friend accidentally stepped on the man’s foot. It turned out that the man was an international tourist and my friend could not speak English and he seemed to be confused because he could not communicate with the man. The others and I just laughed at our friend. But finally we helped him apologize to the man and introduced ourselves. The man is from India, he came to Pangandaran to go on a vacation with his girlfriend who had just just graduated from college. They had a long-distance relationship, India-Germany. Then we continued to tell our stories and continued playing together and finally we exchanged mobile numbers and social media, from here we also got new friends. After spending our time on the green canyon, the next day we continued to our next destination on foot which were no less good, Citumang. Citumang is a place for tourists to do rafting just like in green canyon. However, Citumang is further than green canyon and to reach the rafting place we had to walk for about 1km. What differentiate Citumang from the Green Canyon is that Citumang has a heavier stream so we have to used tires and this place also has a fish pond and the fish can bite our legs or arms to remove dead skin cells. Because of its large current, we playrd slides using tires in Citumang. But suddenly my friend slipped out of the group and was almost carried away by the stream that was marked not to be passed because it was too dangerous. Luckily my friend was saved and finally we continued our game. When we finished playing rafting in this place, our rafting guide told me that my friend who had almost been carried away by the flow was lucky. Because just one month ago, there had been an accident where there was a tourist was carried by the same stream but he could not be saved and he passed away. My guide told me that the tourist passed away because he was carried by a very large stream, and the strean in Citumang flows to the Pangandaran coast, so it is likely that the body of the corpse was carried away to the Pangandaran coast. There was also a mystical story in Citumang, where if you want to raft there, you are not allowed to wear jewelry because usually the jewelry will be lost taken by the watchman. We immediately got goose bumps when we heard this story but we felt relieved because fortunately our friends did not wear any and can be saved. Other strange and mystical events continued at home on our last day staying at the residents’ house. Initially my friends and I were busy watching the Youtube channel of a comedian in Indonesia, Raditya Dika. It was 12 o’clock midnight and we continued watching the video which told him about his house in Jogja which was very haunted. In the video it was told that he was often disturbed by the watchman of the house, then he also told the details of the building’s form. He said that in the house there were wells and in the kitchen there was a window that had ventilation out with a view of a banana tree. After watching the video we were quite scared but still relaxed and one of my friends invited me to make noodles in the kitchen. When my other friend and I went to the kitchen, we realized that next to our room was a well and in the cooking place there was a ventilated window with a view of a banana tree. My friend immediately connected the similarities in the video we had watched and with the situation in the kitchen of the house where we stayed at. Then we were curious to look out the window, the view directly faced the banana tree. And when we were looking at the banana tree we saw a white figure floating around, immediately we ran and slept in the same room. Even though we didn’t know exactly what we actually saw, but because we have watched the video of the horror experience experienced by Raditya Dika and the strange incident that we saw our minds were immediately contaminated by negative thoughts and in the end we slept in the same room until the next day. Alhamdulillah the next day nothing happened and we rushed back to Jatinangor. So many experiences that cannot be forgotten when my friends and I were in Pangandaran, from the experience of visiting beautiful tourist attractions to experiencing strange events that made my KKN story more exciting and made an unforgettable experience for me.